Iran presents its new Qaher F-313 fighter jet, claims it is able to evade radar systems. Iran on Saturday presented a new fighter jet, claiming it is able to evade radar systems, AFP reports. 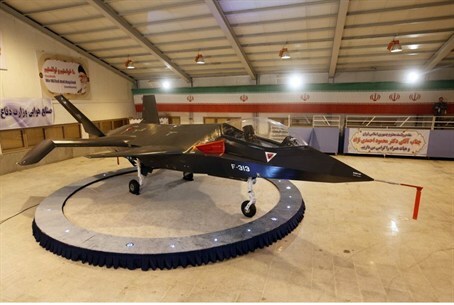 In an unveiling ceremony inside a hangar, President Mahmoud Ahmadinejad unveiled a futuristic-looking fighter jet he said ranks among the most sophisticated aircraft in the world, media reports said. Code-named the Qaher (Conqueror) F-313 and shaped similar to stealth bombers, the grey warplane was designed and built domestically, Ahmadinejad boasted to an audience of defense ministry top brass. It "is among the most advanced fighter jets in the world," he was quoted as having said, while insisting the F-313 was "a deterrent" meant to send a "message of peace" -- despite its aggressive name. Defense Minister Ahmad Vahidi was quoted in media as saying the plane boasted a very low radar signature, and that "advanced materials" were used to build it. The unveiling comes as Iran marks the 34th anniversary of the 1979 revolution, which replaced the U.S.-backed shah with an Islamic regime. Iran traditionally uses the anniversary period to showcase military, space and nuclear advances, against a backdrop of international sanctions. Iranian pronouncements of achievements have increased in recent years, as Tehran desperately aims to prove the West's embargo on its military, technology and economy have failed to dent its determination. On January 28, Iran claimed it sent a monkey into space to an altitude of 120 kilometers for a sub-orbital flight, challenging Security Council sanctions against the development of its ballistic program. Reports on Friday, however, indicated that the “space monkey” may have been made up. Images from a press conference billed as a hero’s welcome for the monkey showed the animal that was sent into space as having light fur and a distinctive red mole over its right eye. The monkey that supposedly returned from space, however, was dark haired and had no mole. Tehran is currently locked in a showdown with the UN Security Council over its disputed nuclear activities, including sensitive uranium enrichment which the West suspects is part of a military program, despite Iranian denials. The resumption of talks between Iran and world powers aimed at resolving international concerns over its activities have stalled for months. The so-called P5+1 group of the United States, Britain, China, France, Russia plus Germany are painfully trying to revive the nuclear talks with Iran and prevent a military solution. The last round of such talks held June in Moscow ended with a stalemate, as did previous rounds. A new round is in the offing, possibly in February, but the sides have failed to agree on date and venue, blaming each other. On Friday, U.S. Vice President Joe Biden warned Iran that opportunities for diplomacy over its disputed nuclear program were not unlimited but offered direct talks between Washington and Tehran.